Welcome to the site. Hila Borenshtein law office is located in the center of Holon, and specialized in Family Law and Inheritance. Hila Borenshtein law office provides a professional consultation and legal representation in the practice of: divorce, common law marriage, child custody, joint custody, visitation rights, child support, alimony, rehabilitative alimony, guardianship, distribution of property, divorce agreements, marital settlement agreement, Inheritance & Wills Law, paternity, get refusal, Mediation, spousal abuse ect. Advocate Hila Borenshtein is a member in the Israeli Bar Association as well as in the family law committee. 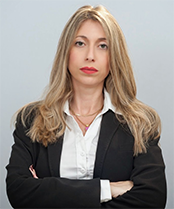 Advocate Borenshtein, a certified mediators and the legal forum manager of both forums "child custody" and "shlom bait" in the Mishpati site, has an extansive experience conducting a complicated and sensitive divorce and inheritance cases. Advocate Borenshthein is representing both in Family court and in the rabbinical beit din, as well as in a higher instance if appeal proceedings is taking place. Hila Borenshtein law office Provides legal services to both English and French speakers.